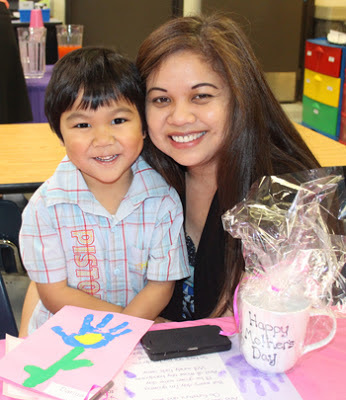 Anaheim Hills Preschool Celebrating Mother's Day with "Mommies and Muffins!" finale when both the JK and Kindergarten students came together on stage to perform "Funga Alafia." This West African folk song has become a tradition for the students to sing each year because it is about friendship. During the song, the children played rhythm sticks, maracas, finger cymbals and our special African tubano drums, creating a magnificent sound of joy and unity! We want to thank our teachers for all their help! Our music teacher, Mrs. Zavoral, directed the show with the tremendous support of Mrs. Foeldi, Mrs. Bush, Ms. Jensen, Miss Johnson, and Miss Dominguez. Check out the pictures on FLICKR!